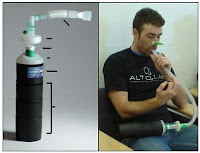 If you are a serious endurance athlete with some extra cash and looking for an edge, I'd take a look at a company called Pharma Pacific that makes the Alto Lab Portable Altitude Simulator. Their protocol calls for a 1 hour treatment for 2 weeks, which they claim can significantly boost EPO and red blood cell production. I like the fact that you can actually measure a drop in blood O2 levels while using the simulator. You can purchase the starter kit for under $200, however that does not include the pulse oximeter (you can probably get a better deal on one of those elsewhere). The all-inclusive Elite package (with oximeter and 3 months of silos which need to be replaced periodically) runs $789. Dave, have you given this tool a try yet? If so, what would you say about it? I am considering one and am looking for reviews. I also sent you an email by the way.